SHE HAD NOT STARTED OUT AS A RABBLE-ROUSER. A decade earlier, Ida B. Wells had arrived in Memphis, a proper young schoolteacher ready to further her education at the local teacher's college and enjoy a night out at the theater. Reconstruction in the political sense, under which the South was brought back into the Union, ended in 1877. But reconstruction of race as a concept and as a social and political weapon continued through the final decades of the century and beyond. The act of lynching, she discovered in 1892, was at the center of that reconstruction. She decided she had better be ready. She bought a pistol. "I felt that one had better die fighting against injustice than to die like a dog or a rat in a trap." 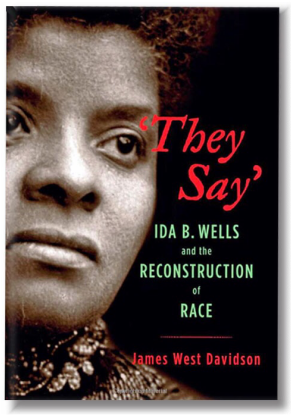 "LYNCHING IS THE GREATEST DISGRACE IN OUR HISTORY, and Ida Wells-Barnett was its most courageous assailant. James West Davidson has written an eloquent account of the growth of Wells-Barnett's self-defined persona as a black woman, journalist, and fearless crusader. Refusing to accept an identity shaped by others—'they say'—she boldly told the world that 'I say' who I am and what I stand for." "LOOKING AT THE VIOLENT, TORMENTED HISTORY of the post-Reconstruction South through the prism of the interior life of Ida B. Wells is a refreshing way to open wider the door on the complexities of race, racism, and identity that, regrettably, still haunt and challenge us today. We need highly readable scholarship like this, infused by the example of the redoubtable Wells, to help give the lie to the old adage that 'we learn from history that we do not learn from history.'"